The evaluation and classification of papillary lesions of the breast are one of the most challenging areas of mammary pathology. The difficulties are even greater when the samples are small, such as those obtained by core-needle biopsy. There are different terminologies for the various entities included under the designation of papillary lesions of the breast, which makes it even more difficult to standardize diagnoses and better understand the biological evolution of these lesions. Papillary lesions comprise a broad spectrum of lesions in terms of their clinical presentation, morphologic appearance, malignant potential, and clinical behavior. Papillary lesions of the breast have in common a pattern of growth characterized by arborescent fibrovascular cores covered by epithelium. The spectrum of papillary lesions ranges from benign to atypical to malignant based on the presence and extent of atypia in the epithelium component along with loss of myoepithelial cells within fibrovascular cores and at the periphery of the lesion. The papillary lesions include central and peripheral papillomas, papillomas with atypical ductal hyperplasia, papillomas with ductal carcinoma in situ, intraductal papillary carcinoma, encapsulated papillary carcinoma, solid papillary carcinoma, and invasive papillary carcinoma. Usually, pathologists find it easy to recognize a papillary lesion of the breast through observation of the proliferation of the digitiform structures covered by epithelium. However, it may be difficult to classify the tumor as benign, atypical, or malignant, and when malignant, there is the challenge of recognizing whether the tumor is in situ or invasive, or if the lesion includes both in situ and invasive components. Recent reviews on diagnostic aspects and biological significance of papillary lesions are available in the literature and are cited in the text and included in the references for those interested. Morphologic features are the most important criteria in evaluating papillary tumors of the breast. However, immunohistochemistry may be useful as an adjunct to diagnosis, both on core-needle biopsy and excisional biopsy. The presence and distribution of myoepithelial cells in the lesion is one of the most helpful features to make the correct diagnosis. In some cases, it may require the use of immunohistochemistry for myoepithelial cell markers. If a papillary lesion is suspected owing to imaging, core biopsy, or macroscopic examination, frozen sections should be avoided because the differential diagnosis between papilloma, atypical, or malignant papillary lesion on frozen sections can be problematic. In addition, the freezing may produce artifacts and distortions that will hamper the definitive classification of the lesion on paraffin sections. In this chapter, we will discuss the definitions, diagnostic criteria, and use of the immunohistochemical markers to aid in the differential diagnosis of papillary lesions. 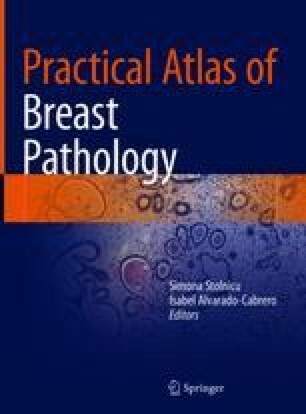 The nomenclature and definitions adopted in this chapter will be those recommended by the 2012 classification of the World Health Organization (WHO) for tumors of the breast.